"Where's that nasty old GDP?" Okay, an ancient allusion: Mighty Mouse was a cartoon character from my youth, a prodigious rodent patterned after Superman. 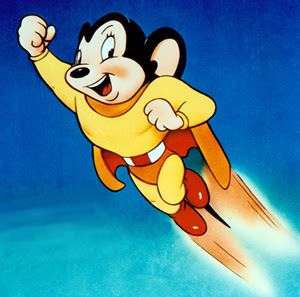 Ben Bernanke isn't either of them, but as with Mighty Mouse's famous tagline -- "Here I come to save the day!" -- the Fed chairman knows how to come to the rescue, however brief may be the effect. In a previous post, I suggested that between the possibility that European and Asian investment money might flow into U.S. markets because their own markets might feel the pinch of slow or negative growth and the likelihood that the Fed would ride herd, so to speak, on our own recovery, there lies the possibility of stable if not up markets through the election. The U.S. economy needs to grow more quickly if it is to produce enough jobs to bring down the unemployment rate, Federal Reserve Chairman Ben Bernanke said on Monday, tamping down expectations of a quick reversal of monetary easing. Bernanke said the recent decline in the jobless rate, which dropped to 8.3 percent in February from 9.1 percent last summer, was "somewhat out of sync" with the rather modest pace of economic growth. U.S. gross domestic product grew 3 percent in the fourth quarter, but is expected to have slowed to just below 2 percent in the first three months of this year. For all of last year, it grew only 1.7 percent, which would normally be too slow to move the unemployment rate lower. Bernanke said the recent drop in the jobless rate could reflect an effort by businesses to recalibrate their payrolls after unusually heavy job cuts during the recession. If this is the case, he said, progress may stall. So this is how it works. Ben Bernanke senses that the economy will stall because growth won't be fast enough to increase unemployment. He said that the Fed should "remain cautious" as it decides future moves. Translation: We'll pump money into the system rather than risking the shallow recovery. President Obama's campaign team must be cluck-clucking just as Team Romney must be shaking their heads in dismay, sputtering, "How can we win if America doesn't crash and burn?" I know, when James Carville famously said, "It's the economy, stupid," he wasn't hoping for a miracle spike in the GDP for ole George Herbert Walker, he was quietly praying for another bad Conference Board report. It's hard to tell the white hats from the black ones. In this case, however, the good guys, from my perspective, are on the right side of America. Er, I mean left. Also, it may mean we can sit passively by as the election year progresses and pay more attention to politics and less attention to our safe -- for now -- portfolios.